We call him Sweet Pete. He came into our lives in 2005 at 18 months. Pete fell in love with his older sis, Cleo and big bro, Okie and quickly became the baby love of the family. He was devastated when they passed so close together. For Pete’s six birthday we adopted a little sister, Taylor, also a HGRR Alumni. They love each other and we could not imagine life without them. Pete’s is clearly the smartest, loving, and funniest companion. He served for 2 years as a working therapy dog, comforting the children after the tragic New Town, CT, shooting. 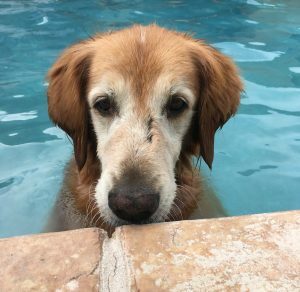 We are thrilled to report he turned 14, Jan 21, 2017, and still has incredible energy and loves swimming in our pool. Thank you Pauline for finding our perfect match.